Little Painted Nails: My Kindergarten Teacher Can Beat Up Your Kindergarten Teacher! My Kindergarten Teacher Can Beat Up Your Kindergarten Teacher! I haven't written in a while, but this is a blog post I've been marinating on since the end of the school year. This year marked the end of an era for the Jacobson clan. Over the last five years we have all gotten to know a fantastic teacher by the name of Connie Le. Mrs. Le was each of my daughters first teacher at Traut Core Knowledge School. After the last day of school I found myself thinking about the teachers who made an impact on my life. I came up with three names, Julie Frink, Ted Snow and Terri Sandelin. I would be willing to bet that none of the three would "A" remember me or "B" know what an impact they had on this 'meh' student. Mrs. Frink was my sixth grade teacher at St. Johns Elementary. 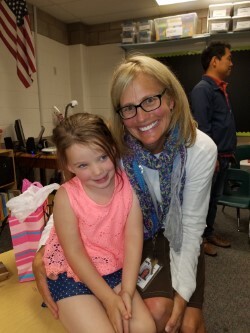 I think that she would be surprised to know that I was a relatively unhappy student when I walked through her classroom door for the first time. I was fresh off of two years of very strict Catholic school teachers and hung out with a group of friends who saw recess as the only redeeming quality of school. She turned it around for me, whether she realizes it or not. Ted Snow was a speech teacher I had during my freshman year of college. He made me able to speak in front of people, which is a fine accomplishment, but more importantly, he taught me to embrace writing and the creativity that goes along with it. NOTE: perhaps I should be cursing Mr. Snow at the same time as he is in large part why I wound up with an English degree as opposed to a degree more valuable than the paper its printed on. Finally, Terri Sandelin was a teacher for several English courses I took at Colorado State. She embraced conversation about literature and its meanings. She was of the belief that there isn't simply a correct answer in literature, in fact, there is an endless supply of correct answers and it is for the reader to sift through them and find the one that brought the text to life for them. I'd like to offer an honorable mention to Dr. Bucco, Sister Martha and Coach McCormick. Here is the rub, these three teachers, and the three honorable mentions, are about all that stick with me for my twenty-ish years of education. This group, for the most part, saw a kid who needed help in one way or another and took the time to give it. I could site plenty of examples of teachers who didn't extend their hands the same way, but this isn't that kind of blog and I'm probably mostly to blame for it anyway. That brings me to Connie Le. Mrs. 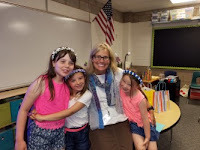 Le was the kindergarten teacher for all three of my children and without hyperbole, they are all incredibly better for it. When I say that, it isn't in a "all kindergarten teachers are great and all the kids are better for it" kind of way. I'll say it this way: if you have children and they had a teacher that wasn't Connie Le, then you officially shortchanged your kids. Okay, maybe that's a step too far and maybe I'm a touch biased, but Mrs. Le was great for our family. Avery was a shy kid. She was an extreme rule follower to the extent that she wouldn't even speak up when she was knocked down in the hallway by another kid because "we aren't allowed to talk in the halls". She needed someone to help her out of her shell. Enter Connie Le. I don't know that Avery would recognize the little girl that entered kindergarten at this point. She blossomed under Mrs.Le's watch. Macy was the opposite of a shy kid. We were concerned that Macy would try to solve all of the worlds problems with her fists. We were nervous going to our first parent teacher conference that we may be sending Macy to therapy, not first grade. As it turns out, with Mrs. Le's help, Macy had become a calming influence in class and had become someone that Mrs. Le sent to calm other kids down. Darby was very young going into kindergarten. We were concerned that we had sent her too soon. Intellectually, she is six going on sixteen but emotionally, she was younger than most of the other kids. No problem for Mrs. Le. We have a little girl that made a bunch of friends, is a veracious reader and seems more comfortable than she ever has. While we will all look forward to seeing Mrs. Le in the halls of Traut, its sad that our last kid has passed through her doors. She recommended that my wife and I consider having another kid as to alleviate the separation anxiety. That seems like a bold step, Connie. Wouldn't it be easier just to start teaching fifth grade? You could still teach our kids and I wouldn't have to build an extension onto the house! The lesson here girls? That's an easy one. You need to appreciate that you have when you have it and be grateful for those who help you along your path. I think it's somewhat sad that the teachers I named that had an influence on my life probably don't know it. That is completely my fault. Teachers are a remarkable lot and my guess is that there isn't nearly enough people telling them that. So, with that, 'Thank You' Mrs. Le. My little brood is a better brood for having had you in our lives. There is not a lot of people who have the ability, compassion and generosity to positively steer the course of someones life. Teachers do just that every day, and Connie Le does it exceptionally well! Speaking of changing someones life for the better, we are still collecting donations for Mai and her son Nash. For those who haven't been reading this blog, Nash was in a terrible car accident when he was hit by an uninsured drunk driver. His road to recovery is a long one and anything you can do helps. Give what you can, every dollar, prayer and share goes a long way! To donate, click HERE, but if you can't do that, share this post, and if that's too much, say a little prayer for Mai and her family. Thanks again!